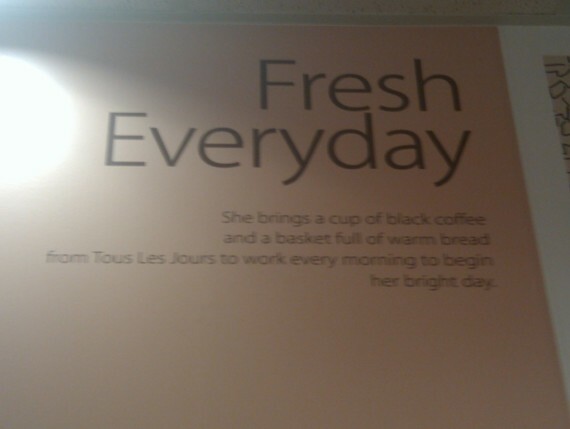 More adventures in imported-grocery stores! At first I thought I was going to just give this a “just wrong” categorization, and I snapped the picture surreptitiously as I ran past. 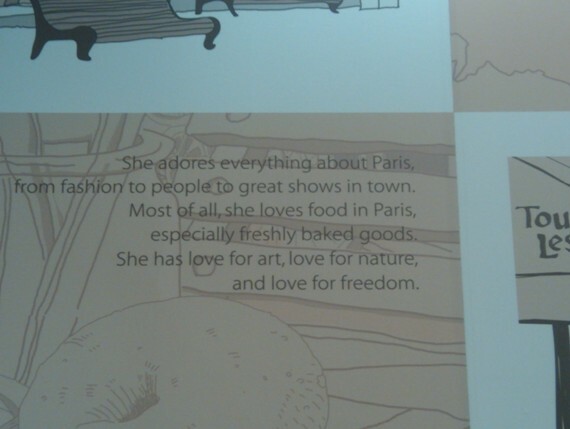 Now I realize there are actually two errors here, besides the obvious. Unless the sauce itself has been “seared at a high temperature and then finished in a covered pot with a variable amount of liquid,” it is not, in fact, braised. And of course “For All Purpose!” needs to be pluralized, even if we forgive the capitalization and exuberant over-use of exclamation points. But honestly: all-purpose? Maybe I just know too many geeks, but I wouldn’t tempt most of my friends with a bottle of food-smelling all-purpose sauce. This product needs a warning label. Speaking of my father, I shall now share a short conversation I had with him yesterday. He: So what was up with that two-week hiatus you took from Red Pen Brigade last month? I: Oh, you know. I was busy, and lazy, and I’m running pretty low on submissions and even lower on feedback. So I just took some time off. He: Well don’t do that! So there you have it. But honestly, I am running low on submissions, and comments are always nice too! 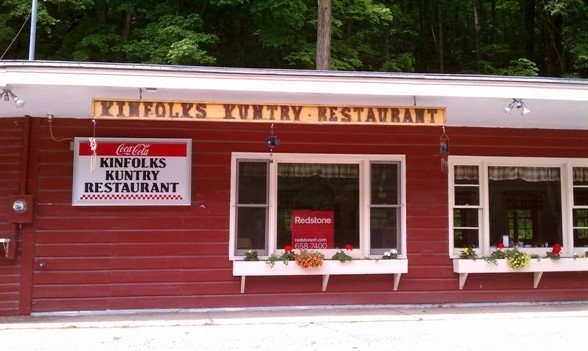 Chris H. found this on his way to Bristol, VT. He says he made his wife turn around so they could photograph it. The real tragedy here, of course, is that this was probably done on purpose. I like to think that’s why this place is apparently for sale. Happy Monday! Ready for some post-modernism? 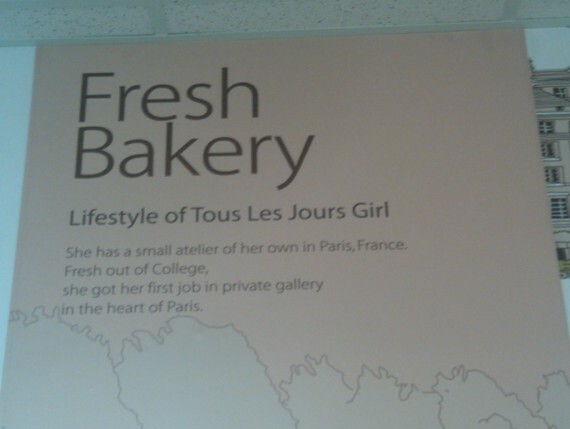 These come from our nearest Tous Les Jours bakery, but I’ve seen them at other TLJ bakeries around town. It’s kind of like poetry! Okay, so, Middle East-o-phile compadres? Remember molokhia, that slimy stuff that actually kind of grew on you (where by “you” I mean “me”) after you ate it for all that time? 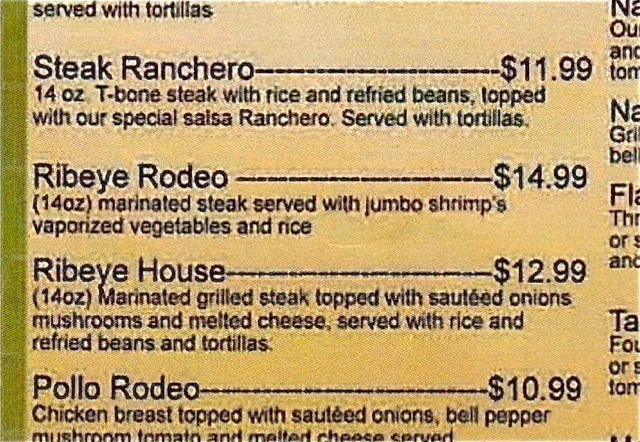 I’m craving some of that right now. This is one of those “thank goodness for the DVR” moments, because we had to pause while I took a minute to blow a gasket. First of all: molokhia is called “JEW’S MALLOW”? What what? I am so in love with the universe right now. That is an awesome name. 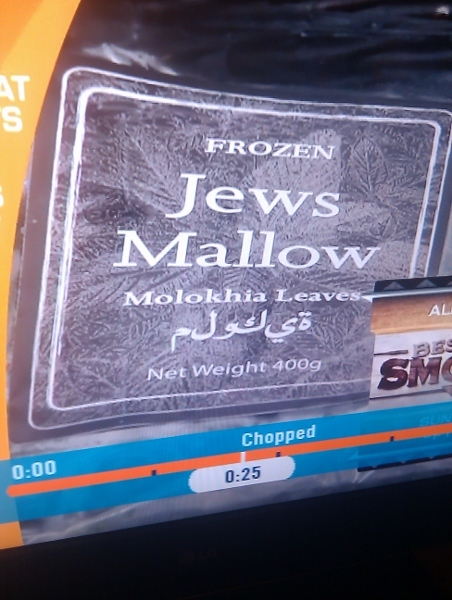 Secondly, can we talk about how there’s not an apostrophe in that “JEWS MALLOW” label? The internet quickly illustrates for me that some fairly respectable sources have quit using the apostrophe, but no, I’m sorry, that makes my teeth hurt. Apostrophe up, people. And lastly? I’ll give you a second. Oh, and I should mention that you should go learn to read Arabic. I’ll wait. Back already? Do you see it? Do you see it??? 10,000 arghs. What the heck did you do, Food Network, copy the label of the molokhia you bought at your local Arab foods grocery store and fail to notice that your word processing software was inputting the letters left to right? 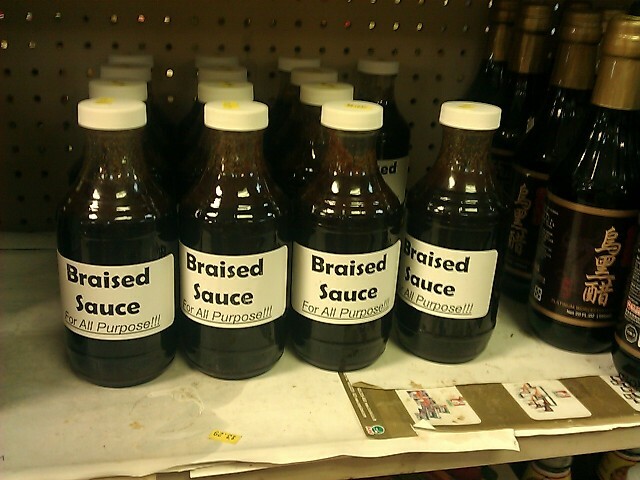 Did you bother to subsequently compare the word on your generic label with the word you were aiming to copy? I know it’s all squiggles, but a critical examination might have indicated you had a problem. When you write right-to-left, it joins like cursive. PLUS, they used the wrong “k” sound (they should have used “kh”). Major Arabic disaster, Food Network. Yeah, yeah, quotation mark abuse, blah blah blah. I’m way more hung up on: this is a THING? 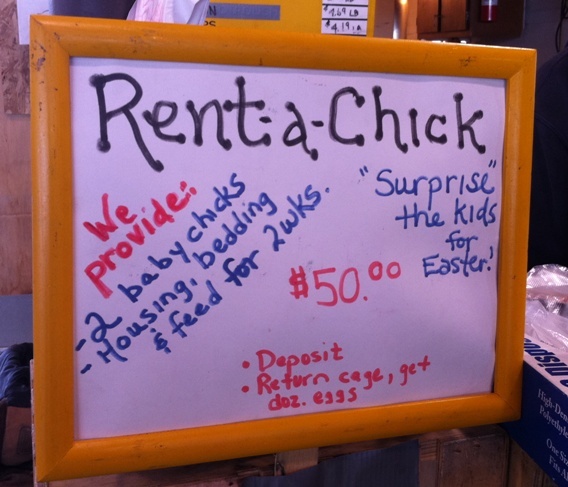 CHICK rental? And hey, if you bring it back alive, you get your money back! Kacia says she’s confused about what she’s supposed to do if the building’s on fire. I’m not sure this sign is even talking about that possibility. 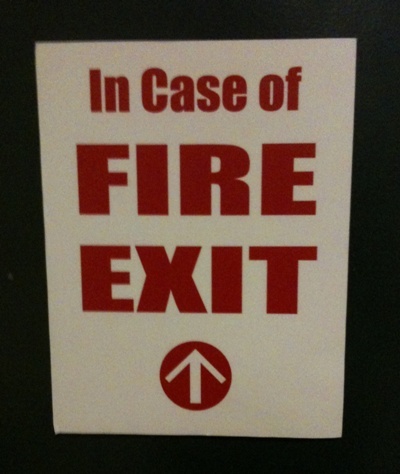 I think it’s part of a longer treatise on what to do if a fire exit exists. But I’m not really sure what it wants me to do, either. 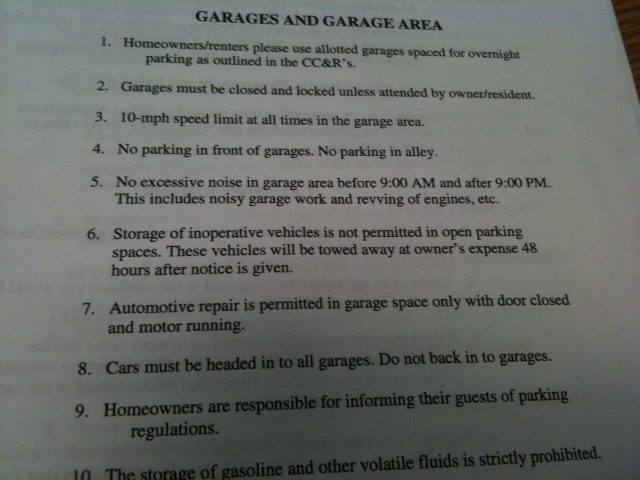 There’s lots to talk about here, but Colleen draws our particular attention to Rule #7, which she feels indicates her HOA is out to kill her. I think she’s right. I’ve been trying to parse that in a reasonable way for ten minutes, and it’s not working. Anybody? …and this jumbo shrimp clearly has vaporized vegetables. Right, Katie K? This is pretty clear to me, so I’m not sure why you sent it in. Oh wait a second… what the heck are vaporized vegetables? 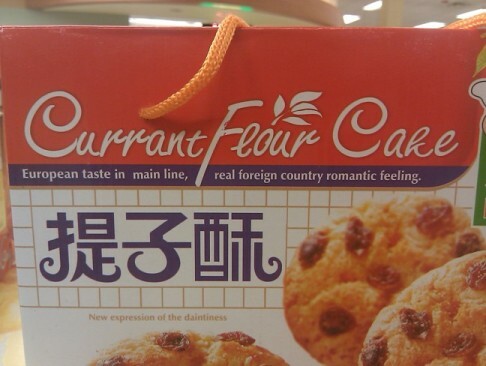 If only they tasted as good as they sound. It is indeed April Fool’s Day. But this packaging is 100% for real. I want to meet the people who write these things. I imagine them as very deep thinkers.